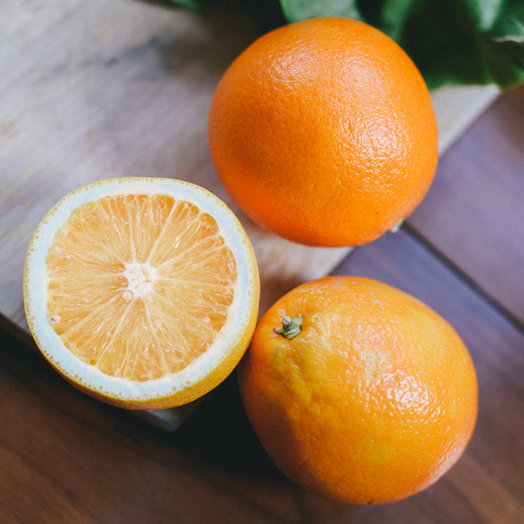 You may notice that Florida citrus has a slightly green color from time to time. Even though this fruit is sweet and completely ripe, some oranges go through a natural process called “regreening” in warm weather. When the fruit ripens on the tree, it turns a bright orange color, as usual. But the warm temperatures of the season may make the skin reabsorb chlorophyll as it hangs on the tree, causing that greenish tint. Don't let this color shift fool you- it is perfectly ripe and often times sweeter, as the warmer temperatures elevate the fruit sugar content in the orange. Oranges keep well in the refrigerator. Oranges can also be stored at room temperature, though they will not last as long. They also yield more juice when stored at room temperature.